The Minnesota Vikings were undefeated at 7-0 as they took on the Tampa Bay Buccaneers on November 1, 1998. 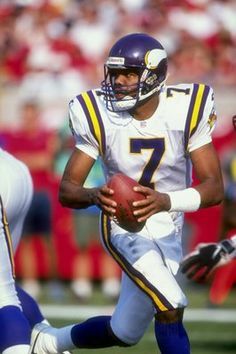 Head Coach Dennis Green’s team had a high-octane offense directed by 35-year-old QB Randall Cunningham, who had taken over for the injured Brad Johnson and impressively resurrected his career. Rookie WR Randy Moss was sensational across from veteran WR Cris Carter and RB Robert Smith made for a good ground attack as well. The Buccaneers were at 3-4 and had already lost badly to the Vikings in the season’s opening week. Under Head Coach Tony Dungy, they were a formidable defensive team, ranked third in the league thus far, that had been having difficulties on offense, failing to reach the end zone against the Saints in a 9-3 loss the previous week. 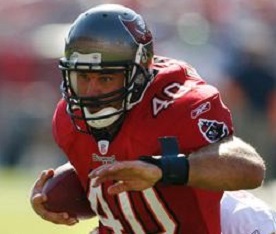 Running backs Mike Alstott (pictured above) and Warrick Dunn made for a productive combination, but QB Trent Dilfer, coming off of a Pro Bowl year in ’97, was inconsistent. There were 64,979 fans in attendance at Raymond James Stadium in Tampa. The Buccaneers took the opening kickoff and drove 65 yards in 13 plays. Warrick Dunn and Mike Alstott ran effectively and Trent Dilfer threw to Dunn twice, once for 14 yards in a third-and-four situation. Dunn finished the series off with a 10-yard carry around end for a touchdown. Michael Husted added the extra point and Tampa Bay was ahead by 7-0. In response, the Vikings came out throwing. Randall Cunningham connected with Randy Moss for 11 yards on first down and then went to TE Andrew Glover for a gain of 30 yards to the Tampa Bay 35. The eight-play, 76-yard drive ended with Robert Smith running up the middle for a nine-yard TD. Gary Anderson added the point after to tie the score. With Alstott running three straight times for 13 yards and Dunn catching a pass for another 13, the Bucs were driving as the first quarter ended. Alstott added a 21-yard carry to the Minnesota 22 and he and Dunn continued to chip away. Dilfer passed to WR Reidel Anthony for a 12-yard touchdown and, with Husted’s conversion, the 13-play drive that covered 80 yards had the home team back in the lead by 14-7. The Vikings started the next possession from their own 10 yard line thanks to a penalty on the kickoff return, but still managed to keep the scoring parade going with a 90-yard drive that took 12 plays. Cunningham immediately threw to WR Jake Reed for 28 yards, the first of four completions during the series. Minnesota converted two third downs and a fourth down along the way before Cunningham threw long to Reed for a 44-yard TD on a third-and-19 play. Anderson’s PAT was successful and the game was again knotted at 14-14. There was 4:16 remaining in the first half as the Buccaneers started their next series. Dilfer completed a pass to WR Bert Emanuel for 15 yards while facing third-and-eight and Dunn had a 50-yard run to the Minnesota 13. An offensive pass interference penalty nullified an apparent touchdown pass to Dunn, but the Bucs came away with points on a 29-yard Husted field goal. With the clock now down to 36 seconds, Cunningham went to the air and completed three straight passes, the longest to Moss for 41 yards. Anderson capped the first half scoring with a 44-yard field goal and the tally was 17-17 at halftime. Thus far, neither team had punted or turned the ball over. Dunn (pictured below) already had 80 rushing yards and Alstott had contributed 50. The pattern of long drives ending with scores continued in the third quarter as the Vikings advanced 75 yards in nine plays. Cunningham had passes to Glover for 25 yards and Reed for 32. The series ended with a short Cunningham toss to Reed for a one-yard TD. Anderson’s extra point put the visitors ahead by 24-17. The Bucs moved methodically down the field in response. Alstott had a 15-yard run and Dilfer completed a pass to Anthony for 16 yards, but the drive bogged down inside the Minnesota 10 and, facing fourth-and-goal at the five, Dilfer’s throw intended for Anthony was knocked away and incomplete. The Vikings had the ball as the contest entered the final period. Cunningham completed four passes, but after reaching their own 36, another throw that came as he was hit hard by LB Al Singleton was intercepted by LB Derrick Brooks, who returned it 25 yards to the Minnesota 23. The Buccaneers went three-and-out but came away with a 38-yard field goal by Husted to narrow the Vikings’ lead to 24-20. Minnesota was forced to punt following the next series, which was the first of the game with ten minutes to go in regulation. The big play in stopping the Vikings came when CB Ronde Barber sacked Cunningham, who had eluded Brooks, on third down. The Bucs came away with good starting field position at the Minnesota 43. Dilfer connected with Anthony for a gain of 17 yards and Dunn followed up with a nine-yard run. Alstott lost a yard, but Dilfer converted a third-and-two situation with a three-yard carry. A pass into the end zone was deflected away, and then Dunn ran for nine yards and Alstott finished off the seven-play possession with a six-yard touchdown. Husted added the point after and Tampa Bay was ahead by three. There was 5:48 left on the clock, plenty of time for the quick-striking Vikings. A Cunningham pass to Cris Carter was flagged for offensive pass interference and a sack by DT Brad Culpepper forced Minnesota to have to punt once again. The Vikings never got the ball back as the Buccaneers, behind the running of Alstott, controlled it for the remaining three minutes of the game. Alstott ran for a 37-yard gain and game-clinching first down and the Buccaneers won by a final score of 27-24. Tampa Bay had the edge in total yards (378 to 340), with a franchise-record 246 yards gained on the ground, and in first downs (22 to 18). The Buccaneers, who also ran far more plays than Minnesota (63 to 46), never punted or turned the ball over, and gave up no sacks. The Vikings accounted for the game’s lone turnover and gave up two sacks, all of which proved costly. They also were held to just 17 yards and scored no points in the fourth quarter, which proved to be decisive. Both Mike Alstott and Warrick Dunn gained over a hundred yards running, the first time in Tampa Bay’s team history that two players had done so in the same contest. Alstott gained 128 yards on 19 carries that included a touchdown and Warrick Dunn had 115 yards on 18 attempts that also contained a TD. In addition, Dunn caught four passes for 49 yards. Trent Dilfer was 11 of 22 for 132 yards through the air, with a touchdown and no interceptions. Reidel Anthony topped the club with 5 pass receptions for 65 yards and a score. For the Vikings, Randall Cunningham (pictured at right) was outstanding as he was successful on 21 of 25 throws for 291 yards and two TDs while giving up one interception. Jake Reed had his biggest game of the year as he caught 6 passes for 117 yards and two touchdowns while Randy Moss and Cris Carter were comparatively quiet, catching two passes for 52 yards and two for 13, respectively. Robert Smith ran for 46 yards and a TD on 13 carries and had 5 receptions for 28 yards. The Buccaneers went on to lose their next three games before rallying to take four of their last five on the way to an 8-8 finish that placed third in the NFC Central. Minnesota didn’t lose again for the remainder of the regular season, topping the entire conference at 15-1 while setting a NFL record by scoring 556 points. However, it all ended in disappointment with an overtime loss to the Atlanta Falcons in the NFC Championship game. 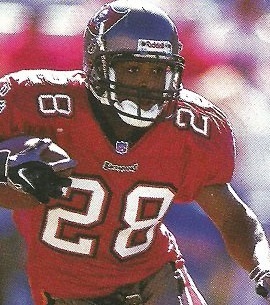 Warrick Dunn gained 1370 yards from scrimmage, with 1026 on 245 rushing attempts (4.2 avg.) and 344 yards on 44 pass receptions. Mike Alstott gained 846 yards on 215 carries (3.9 avg.) and received first-team All-NFL and Pro Bowl honors.